"I Don't Play The Heroine!' 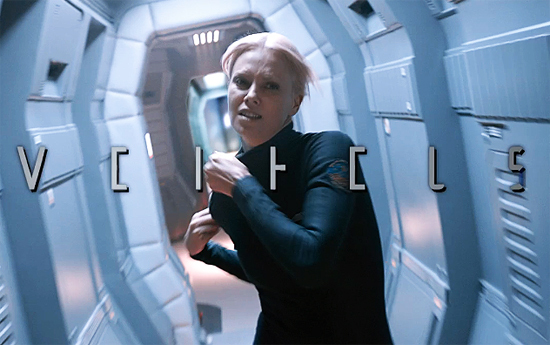 Charlize Theron Talks Playing the Villain in Ridley Scott's 'PROMETHEUS'! With 20th Century Fox debuting the first trailer for Ridley Scott's Prometheus this week some of the shackles that have kept the projects details airtight are being loosened. Charlize Theron who plays Vickers a company rep who joins the crew of the Prometheus on its journey recently sat down with TotalFilm. The actress was asked if her character Vickers was simular to Sigourney Weaver’s Ripley in Scott's 1979 original Alien. Theron also once again addressed the never ending question of whether Prometheus would feature Aliens. Set in the late-21st century, Prometheus will explore the advanced civilization of an extraterrestrial race responsible for the origins of modern humans on Earth, as well as the background of the Alien creature which made its first appearance in the 1979 film. Hit the jump for the details. Theron: "No, I actually don’t play the heroine in it; that’s Noomi Rapace. I play somewhat of a villain in it.” [My character] is not a believer, she’s not a scientist, she is the red tape that everyone has to go through. She’s working with the company that’s sponsoring this whole thing and you can feel she definitely has an agenda, which we pick up in the third act. She’s more quiet thunder." Theron: "Maybe! I mean if you’re a Ridley Scott fan and you love the genre, then you’re going to be happy. You’re going to be very, very happy." Prometheus hits theaters June 8th 2012 & also stars Noomi Rapace, Michael Fassbender, Idris Elba, Sean Harris, Kate Dickie, Guy Pearce, Rafe Spall, Benedict Wong, Emun Elliott & Logan Marshall-Green. The movie hits theaters June 8th 2012. Scripted by Damon Lindelof, Jon Spaihts & Scott. TotalFilm will contain a more extended interview in its upcoming issue. I'm reading: "I Don't Play The Heroine!' Charlize Theron Talks Playing the Villain in Ridley Scott's 'PROMETHEUS'!Tweet this!